In this blog, we look at a specific example of incorporating lay health workers into the primary care health care team as “care guides“. The Health Affairs Blog highlighted the Robina project, which hired 12 lay health care workers (care guides) to work as part of a health care team serving patients with chronic diseases. These care guides did not have any medical training, but received a two week training on a number of topics including electronic health records, specific information about disease (hypertension, diabetes, and heart failure), tobacco cessation and motivational coaching. The main objective of the care guides was to help patients reach disease-specific goals, but aside from quarterly reports about how the patients were achieving or not achieving goals, it was not specified how they would go about helping the patients work towards reaching their goals. The care guides and patients decided on their own how often and how (face-to-face or by telephone) to contact each other. Despite, or perhaps owing to the open-ended nature of this program, the results of the study indicated great success. Patients with care guides were 31 percent more likely to meet care goals than usual care patients, and 21 percent more likely to quit use of tobacco. Patients also reported a high degree of satisfaction with the program and significantly more positive perceptions of their care. Finally, they perceived more social support and a greater understanding of how to improve their health. The Health Affairs blog elaborates with specific examples of how the care guides helped patients achieve their goals. For example, a patient recently hospitalized for a heart attack communicated with a care guide that he was not attending a recommended cardiac rehabilitation program because he did not believe it was covered by insurance. After the care guide confirmed the sessions were covered and that the rehabilitation center was a short bus ride away, the patient decided to attend the sessions. This example illustrates a mechanism that may make lay health workers, like care guides or peer supporters, so successful. By having the opportunity to have informal communications regarding health care and chronic diseases, issues can be discussed that may not otherwise come up in the 6 hours patients with a physician per year. While a physician may not have the opportunity to provide information about transit for a rehabilitation center at an individual meeting, this kind information can be provided to patients as part of the support provided by lay health workers. The results of this study suggest that this kind of support can make a clinical difference in patient outcomes beyond this one specific example. As we continue to move forward and explore the role of lay health workers as part of a health care team, we can look at programs like the Robina Project to better inform us of specific ways to incorporate them. 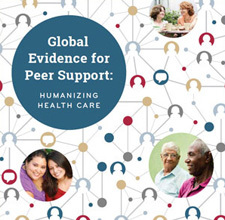 We encourage our readers to continue to share and highlight their own programs and studies that successfully achieve the critical goal of incorporating peer support, community health workers and other lay health workers into the health care system.